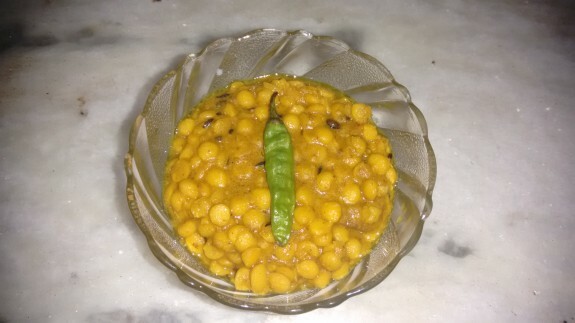 Bengali style misti cholar dal or Sweet Split Chick Peas is a lentil dish which is really delicious and tasty. The twist of coconut is making the cholar dal yummy. 1. Soak the Split check peas or Cholar Dal for overnight. 2. In a big pan add 1 ltr water and soaked cholar dal and boil it. 3. While Split chick peas are about to boil, add turmeric powder, salt and sugar. Keep the heat off. 1. Heat 2 tbsp oil in a pan. Add bay leaf, red chilli, cumin seeds, coriander seeds and whole cardamom, cinnamom and clove and sauté it lightly. Remember don’t over heat the oil otherwise all the masala will lose its sweet smell. Add chopped coconut and cook till it light brown. Add the boiled chickpeas with water in it. Mix it properly. 2. Add turmeric, salt if required. Add 3 tsp sugar and mix properly. Cook 4-5 mins. 3. Add grinded coconuts and 1 tbsp ghee. 4. Remove from heat and your Misti Cholar Dal or Sweet Split chick peas is ready to serve.